Certain men have the habit of sleeping naked, others prefer the softness and comfort of a good pyjama. In cotton or in velvet, pyjamas of large brands will bring you warmness all evening and night. To warm up during winter or to cover during summer, pyjamas and dressing gowns in destocking are available on Mesdessous.fr. Eden Park, Eminence, HOM and Massana display all of their savoir-faire for your daily comfort. Pajamas, Nightgowns There are 16 products. Athena long pajamas in velvet material. Sizes 2 to 6. Composition: 75% cotton, 25% polyester. Do you like to be casual at home? Do you like to sleep with quality pajamas that is stylish without breaking your piggy bank? The universe destocking man pajamas and dressing gowns offers you the best brands of homewear such as MASSANA, HOM, EMINENCE, ATHENA. 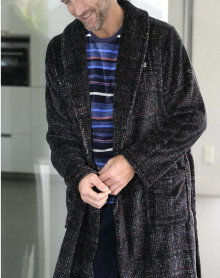 You will find long or short pajamas, simple or with patterns and different models of dressing gowns to stay warm. These end of series will seduce you, especially by their low prices.